With my pointy arrow and swell pocketbook, I’ve decided to kick-off my birthday weekend with a little pictorial, showcasing a few of my favorite things in Paris: Place Vendôme at l’heure bleue, Jambon Beurre Gruyère baguettes, the clocks at the Musée d’Orsay, and the bells of Notre Dame. There, I’ve said it. And thanks to WordPress, I’m already having a great birthday weekend. Thank you for the bright Freshly Pressed spotlight. This means a lot to me. I was thrilled when they featured my recent “Paris: 5 Iconic Backdrops for Photo-ops” story. What a gift! Right now I’m off on a working field trip, but over the weekend and throughout next week, I’ll respond to your gorgeous comments and pay more than a few visits. So get ready! But before I forget, I must give a shout-out to my chum Virginia over at Bel’ Occhio for the beautiful birthday post. I’m still grinning. Merci! Everyone looks like they are having such a great time in his photos! Great photos per usual (and text, too, of course.) Most importantly, have a wonderful, blessed birthday and the best birthday year ever!! Now I have to eat lunch. Those baguettes got to me! Thanks, Janet! I appreciate your sweet birthday message. I’ve just returned from my work field trip! YES. I’m a big fan of the sandwich. They’re affordable and oh, so portable. The perfect moveable feast! T.
Stop it!!! You’re making me hungry! The best thing is that you can get these lovely things in all sorts of places that aren’t in the least fancy and you can even get rather good sandwiches in the plazas along the highway. Hope you had a enjoyable and fruitful trip. I know! I know! And the illustrated bags are also showstoppers! Great souvenirs! T.
Happy Birthday. Your blog is a delight! Well, thank you, OUT & ABOUT in the City!! I appreciate your kind words. YES. It was a swell birthday gift to receive during my birthday week. Perfect timing! Confession: After receiving the email from WordPress, I jumped up and down for hours. Maybe days. Oh, la la!! T.
Merci! Merci!! I think you’d love the exhibition at the Musée d’Orsay. I returned for a second and third visit. “L’ange du bizarre. Le romantisme noir de Goya à Max Ernst” (The Angel of the Odd. Dark Romanticism from Goya to Max Ernst) opened on the 5th of March, and stay up through the 9th of June.) They even included footage from James Whale’s “Frankinstein” (1931, starring Boris Karloff) and Hitchcock’s “Rebecca” (1940). Fascinating and beautiful! Haunting, too. T.
No, haven’t had the chance to use it yet – certainly is a great price though, even with its limited service cities. Happy Birthday and thanks for sharing the beautiful photos! Wow! freshly pressed – not at all surprised to hear that. Your blog is a delight. Wonderful photos, as always and thanks for all the information. Well, hello there, Happy Face!! It wouldn’t be a true birthday week without spotting your sunny words. Positive energy is so contagious. As always, thanks for spreading the joy. 🙂 Merci!! T.
Happy birthday!! It’s always a big pleasure reading your posts! Happy birthday, Theadora, and congratulations on being freshly pressed. I enjoy your articles about Paris very much. 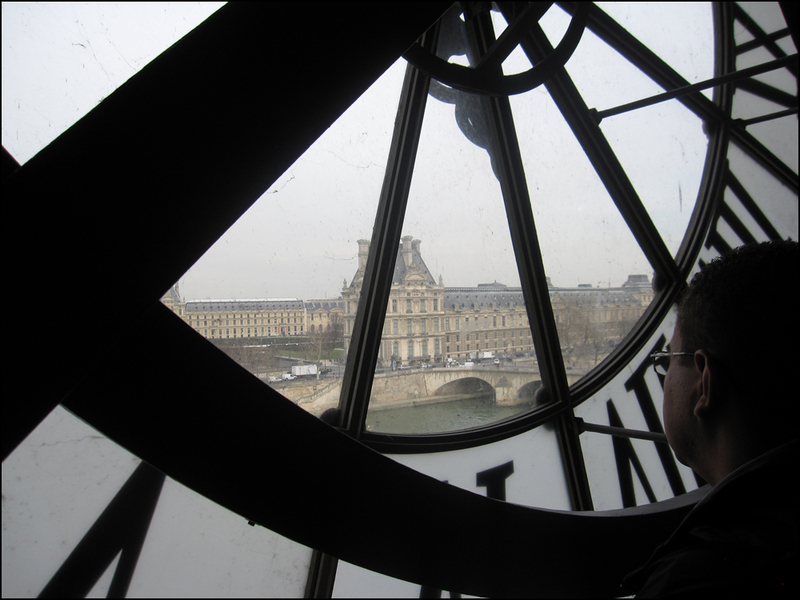 I love the view from the MUSÉE D’ORSAY, and that wonderful clock. Have an amazing weekend. You’re killing me! BUT THANKS! Tee. Hee. Hee. Add a rich and hot coffee, topped with a thick layer of foam. Each and every time, the experience transports me to heaven. It’s all about the little things in life! T.
Bonne anniversaire! Félicitations! Congrats on being Freshly Pressed – well deserved! Lunchtime in Paris. My daughter and I had trod the halls of the Louvre then shopped Yves Delorme, stocking up on linen. We are starving. We passed a small delicatessen. 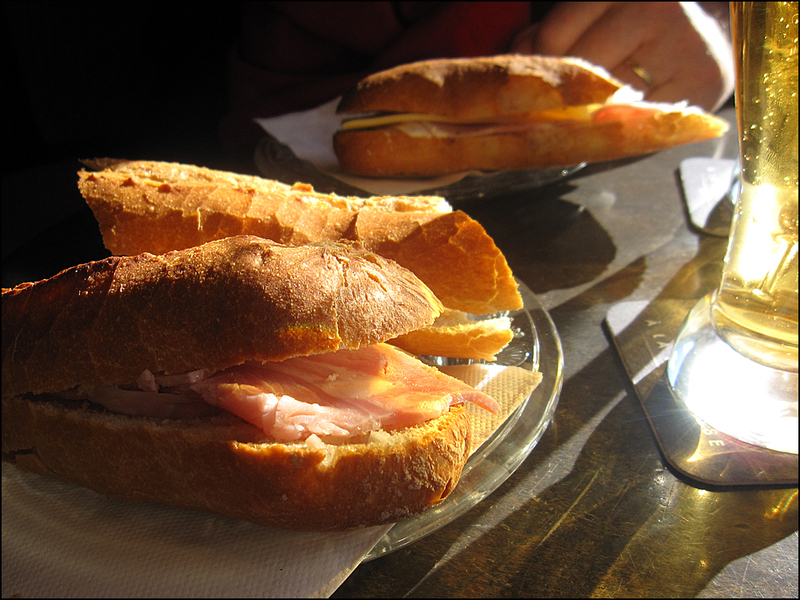 There was a line-up for their baguettes – crusty, fresh rolls filled with cheese and ham. Each one made fresh – just for you. Your photograph brought that wonderful April day back to me. Food really does evoke strong memories Theadora. V.
It was raining. April. We didn’t care. We were together and we were in Paris. V.
HAPPY BIRTHDAY TO YOU! I hope you have a wonderful weekend and a blessed birthday year. As always, thank YOU for your words of encouragement! I’m still celebrating, living in the moment with few midnight jogs under the moon and some seashell beach combing. Enjoy the week! T.
Happy Birthday wishes to you Theadora! Your photos as usual are gorgeous – sunshine croissants and clocks et al and trust there will be champagne for further worthy celebrations. As for Fresh Pressed, congratulations! You will always be a fresh press delight for me! 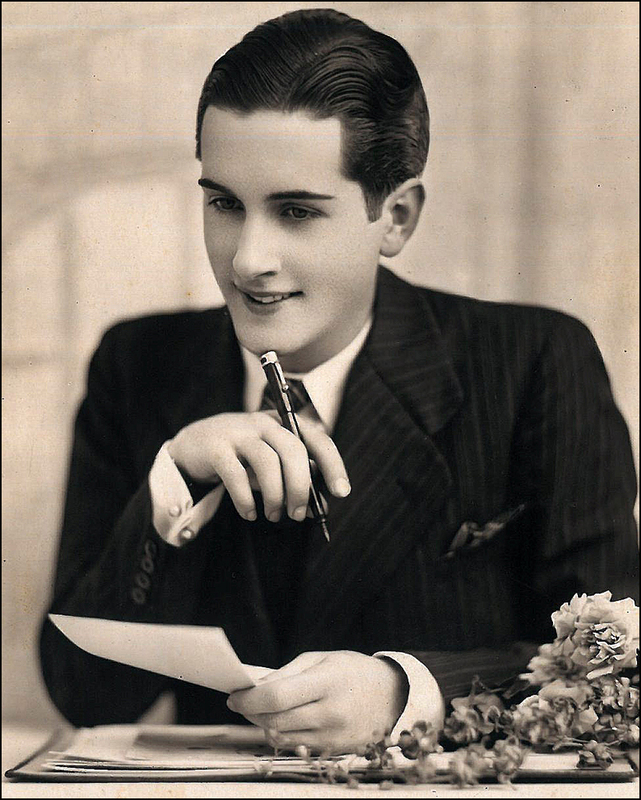 Happy Birthday – may they all be as lovely as this one! Furrylittlegnome LOVES Sophia Petrillo! In fact, Dorothy referred to Sophia as a furry little gnome! Estelle Getty was AB-FAB. With impeccable timing, to boot! T.
21 forever…..enjoy every minute as though it was your last……as Oscar said “rage…rage against the coming of the light”. AH. Glorious. What a fabulous, fabulous birthday quote. PERFECTION. Thank you, sir! Thank you, Oscar. T.
Happy Birthday! I pine! I pine! Merci!! Next year I’ll celebrate in my pajamas or satin lounge wear at designer David Carter’s “40 Winks.” I just spotted your recent nod to the joint! Oh, my. I am in love. The bathtub is divine!! Divine. T.
Isn’t our Virginia wonderful! Happy Birthday from Lisbon. I love you so and send you the very best of wishes! YES. Our Virginia is pretty darn wonderful!! And so are you!! Safe journey to you, Monsieur Tin Man. I’m already looking forward to reading your Yellow Brick Road reports. Big hugs and take care of your ruby red shoes and flying monkeys! Feed them well! Love, T.
Happy Birthday! I do so enjoy your blog and your posts. The joy you bring to others I hope can be yours during the next year and many more! It will give a lovely light! Thank you, Karen! I thoroughly enjoyed the weekend. I always look forward to your inspiring posts. It IS easy being green! Happy Earth Day (April 22, 2013)!! T.
Merci, Meg!! I plan to write a full post about Musée d’Orsay. I took many photographs! It’s one of my favorite places in the city. Plus, there’s a fabulous little perfume shop a hop, skip and jump away from the museum. It’s been there for decades. And so has the manager! She knows scents and people. A matchmaker!! T.
Happy Birthday, T! What a great way to celebrate. Love your D’Orsay shots to bits! Have a great one. Ah, bonne anniversaire, Mlle B!!! May many good things come to you all year, but especially at “l’heure bleu”! Love, love these images, the colors of early twilight still sumptuous…and though I’ve just eaten, les baguettes look awfully sumptuous, too! Being ‘inside’ the clock is just too perfect a spot to celebrate! Wish I had known the date–I’d have sent a surprise! YES. Especially at l’heure bleue—my favorite time of the day. It moves me each and every time. There’s something so soothing about sunsets and sunrises, too. Why do I love them so? Mulling starts now as I’m hum the “Twilight” song by the Ink Spots and Platters. I’ll report back . . .
And speaking of clocks and time, your recent shots of the Chicago sunrise through the bare trees are gorgeous. Ah, merci, Mlle B.! L’heure bleue is also my favorite, though this evening I fear it will be more of a deep golden gray…so many clouds and much, much rain today! Happy Birthday Theadora, I hope you had a wonderful day – if the pictures are a true reflection of your day, then it was fab – love the baguette and the hints on great places to go. Duly noted in my journal for next May! As for being in the WordPress spotlight, you absolutely deserve it – your posts are always brilliant. Wow, thanks for the recommendation Theadora – really appreciated and now noted in my journal – as you say, May is just around the corner but sadly our visit is not until May 2014. At the moment, I am nannying for my daughter during her second pregnancy. Baby is due in August and our treat to ourselves post the birth will be our trip to France – it dangles like the proverbial carrot! 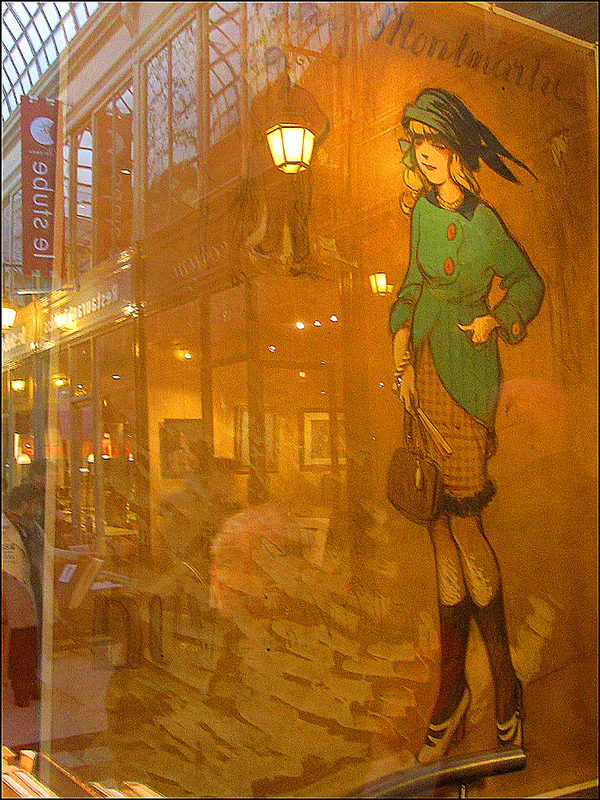 We wanted to be in Paris in the spring hence the long wait…..but I am so enjoying doing research meantime – where to go, where to stay, what to see etc, so your posts are invaluable. Happy birthday!! What great events to surround such a wonderful occasion : ) Congrats on Freshly Pressed. As usual, you’re making me want to move to Paris. Annnd I love your cover photo of the elephant and the Eiffel Tower. Have a great time! Thank you!! I scored model Monsieur Mammoth at the Porte de Vanves Flea Market!! Our photo shoot took place at the Jardin du Luxembourg later on in the day. A dramatic storm was approaching but he stayed cool as a cucumber. He’s quite photogenic, eh? Say, I just read about the your favorite joint. Sigh. What would Hem, Hadley, Zelda and Scott do? Good luck “tapping into your inner F. Scott Fitzgerald.” Great line!! T.
Ah, thank you, Vanessa!! 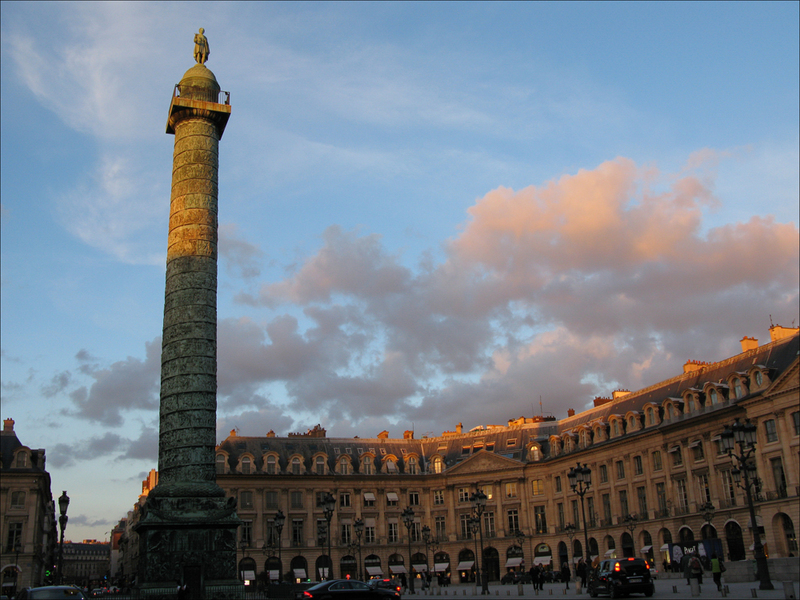 Do you have a favorite spot in Paris for watching the sunsets? T.
Wow, congrats on the well-deserved Freshly Pressed! It’s always so much fun to watch the blog stats go completely crazy for a few days, and to grab a bunch of new followers in the process. I had no idea you could have tea next to the Orsay clock. My mom’s coming into town soon and I think I’ll definitely be offering this activity while she’s here! Bonjour, Corey! YES. You’ve enjoyed the hustling, bustling Freshly Pressed wheel. Your Montmartre-Abbesses snow shots were so lovely! I shot the first clock in the museum café on the top floor. It’s a little pricey but there is no fee to shoot. I shot the second clock outside the French Impression gallery (K). Don’t miss the L’ange du bizarre. Le romantisme noir de Goya à Max Ernst (The Angel of the Odd). The exhibition runs through the 9th of June. Lovely. Haunting, too. I’d also take your mother to the affordable garden café at the Petit Palais. What a sweet spot. Heaven!! Love this picture from inside the clock. Bings back great memories of first trip to Paris and has remained one of my favorite spots …and the museum is fantastic. Thanks for the blog sharing your personal favorites. Merci!! The Musée d’Orsay is a fantastic spot. Do you have any other favorites? 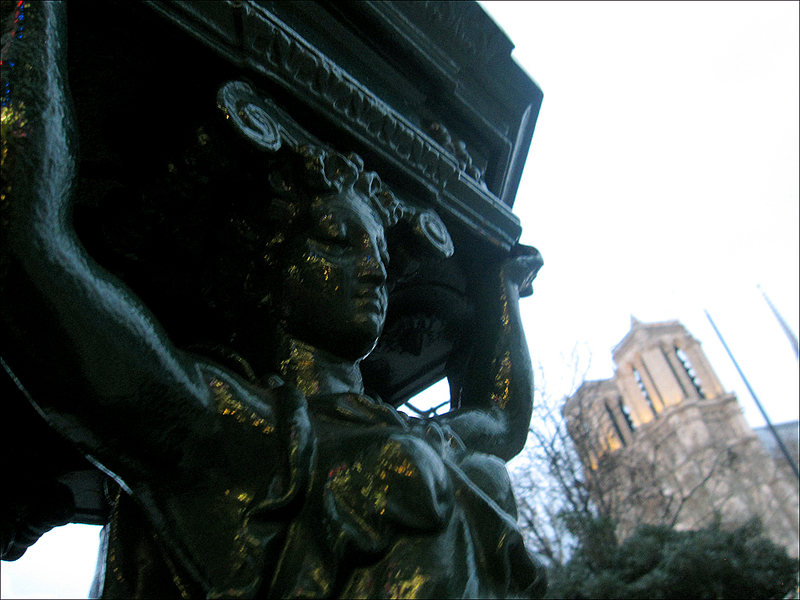 Any poems about Paris?! T.
A very Happy Birthday… looks like it was a nice weekend of enjoying the occasion. As usual, great pics. I remember my trying to get interesting shots of the clock from inside… I wonder what I did with them? Thanks, Thom! YES. I am still enjoying my birthday week! Ah, so you also took photographs of the clocks inside the Musée d’Orsay. Let me know if you find them. I’d love to see your shots! T.
Thanks so much for the well wishes 🙂 Your posts are always spot on. Very cool stuff. Always looking forward to more! Congratulations on the Spotlight! Much deserved! And of course, Happy Birthday! Thank you for always keeping up with us at The Eye of Faith (ever since we were young! ), and continuing to follow us. It makes me so happy that a girl with as great taste as you do, can appreciate the world we have to offer. Looks like you had a gorgeous day. How can any day in Paris go wrong? 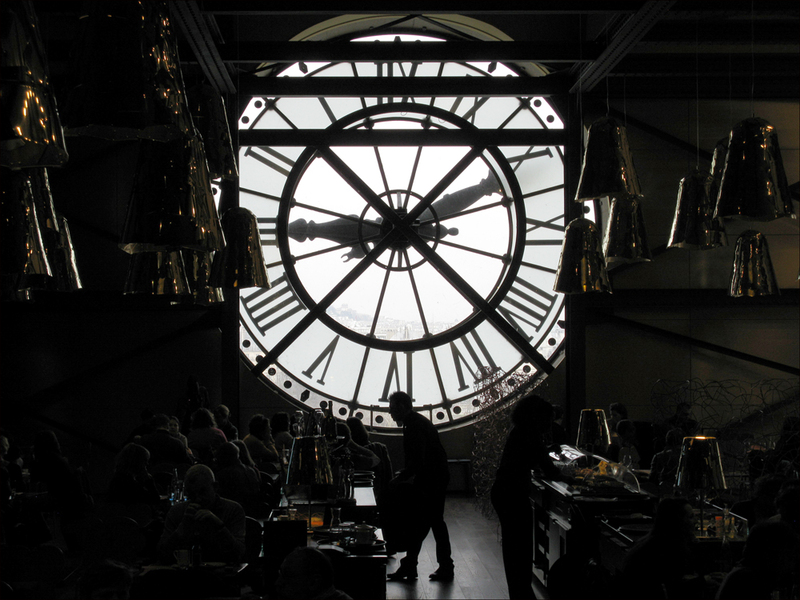 I really love those pictures of the clock in the Musee d’Orsay. Absolutely magical. I’d be holding onto that memory forever. . .
Much love, and sending out good vibes! Ah, the always FLY Eye! How great to hear from you. Thank you for the thoughtful words! And YES. This gal (with sublime taste!) has been a long time believer and admirer of your site. It’s true I love how you mesh historical tidbits, vintage clothing, tawdry gossip, and AB FAB images. Bravo!! Sending back BIG love and positive vibes! (The Musée d’Orsay is one of my favorite spots on the planet. You’d love the current exhibition: “L’ange du bizarre. Le romantisme noir de Goya à Max Ernst” (The Angel of the Odd. Dark Romanticism from Goya to Max Ernst)! I had no idea about the Freshly Pressed! What a great surprise that must have been. I’m also super jealous that you go into the clock tower at the Musée d’Orsay. That’s not open to the public is it? Wow, what an incredible birthday! Then again, you sure deserve it! Happy birthday! What a great way to celebrate – Paris favorites. Hooray! Merci, Julianne!! I loved reading about your Paris trip. You were there one year ago?! Are you still wearing the fabulous pink hat? Say, where did you find it? It was a beauty! T.
Yes, we went last March – I’m impressed that you remember, thank you! – and I’m still pining for it. Still wearing the hat, also, which I got at La Boutique a Chapeaux on Rue St. Honore – will hopefully get more wear out of it now that we’re moving into beautiful summer weather from a rainy Portland winter. I’m a little bit late but Joyeux Anniversaire ! And congrats for featuring in WordPress’ “Freshly Pressed” !!! Your posts are always fabulous and interesting, so keep on the stunning work ! Merci! As you know, I feel the same way about your fashion reports. I always recognize your posts before spotting the “Fashion Mayann” credit. It’s true! T.
Merci beaucoup for your lovely compliments ! I’ve been trying to do some research and plan, but have very little time for that. I really need to get to it soon! No problem! Ask away!! T.
The recognition you receive you richly deserve! Congratulations and happy (belated) birthday from Chicago! Well, thank you, Celia! Chicago is one of my favorite cities in the world. You are very lucky!! T.
Bon anniversaire, Theadora! These photos top them all (and that’s saying something!). Merci, Touch2Touch! YES. I do the love the baguette sandwich. It’s true. The Café de la Mairie in Saint-Germain-Des-Prés makes a mean Baguette Cantal Beurre. Baguette Jambon Beurre Gruyère is another winner. I usually pair it with a coffee! You’ll appreciate this tidbit! Here is where literary favorites CONNECTED: Saul Bellow, Djuna Barnes, Henry Valentine Miller, Anaïs Nin, and Ernest Hemingway, along with F. Scott Fitzgerald, James Joyce, Samuel Becket, Jean-Paul Sartre, Albert Camus, and Simone de Beauvoir—just to name a few! And it’s one of my favorite places to connect with friends and my sketchbook! Enjoy the weekend! Happy Birthday! a little late yet the sentiment is still the same! 🙂 http://iamforchange.wordpress.com/awards-page-and-nominations-thank-you-i-am-so-honored-and-grateful/ I wanted to share with you and say thank you! That baguette looks delicious. Have you been to Cafe Panis near Notre Dame? Got a creme brulee there that was incredible. Oh, nice tip, James! The Café Panis has been on my list. It’s also near the Shakespeare & Co. Bookshop. Perfect location with a fabulous view (21 Quai de Montebello, 5th arrondissement). YES. I will try the Crème Brûlée. Thanks for the push!! T.
Happy Belated Birthday to you! 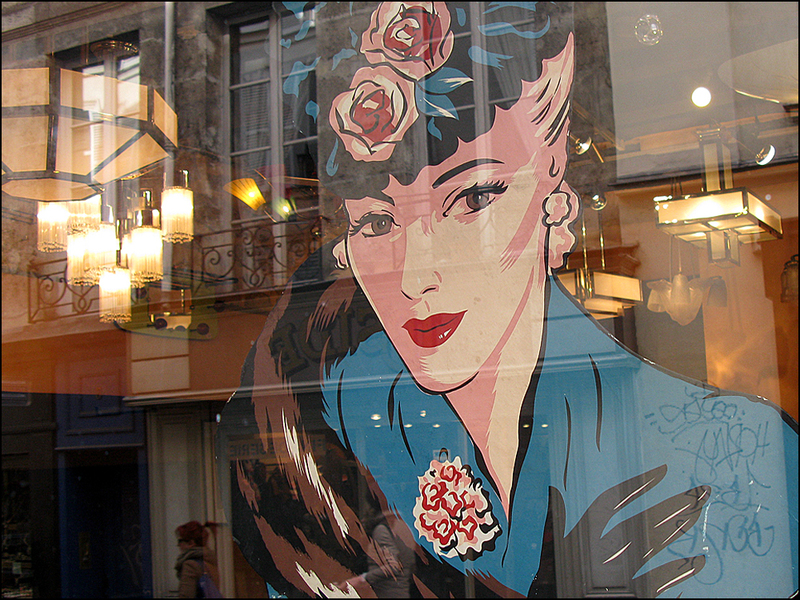 The artwork in the store windows is beautiful and tea place is really super! Pingback: Un passage à vide | One quality, the finest. I love love love love the 7th & 8th photo..and the last two…. And here it is, the most belated birthday greeting ever. ¡Feliz cumpleaños, nena! Had I not been completely WordPress MIA mid-April, I would have re-posted the “Throw Your Own M@ Birthday Party” in your honor. I hope you Marie Antoinetted the hell out of your special day! It’s good to be back with your brilliant photos, tightly-written posts and oh! that bling! ps – if you should happen to have any toile de jouy images in your vast archives that would make for a new blog background, I’d be most obliged! Congratulations on being Freshly Pressed! You deserve it! Happy birthday too as I missed it. Cheers. Thanks for the recent visit to my blog – it was an honor.